One of the most enjoyable aspects of cold weather is the ability to play in the snow. Whatever your age, there’s an inherent joy found in creating a snowman or snow fort. And exploring a creative take on this classic winter activity is even better. Here are fourteen chilly projects sure to inspire your winter creativity. Almost all of them are by DIY sculptors, and there’s sure to be something here that matches your artistic flair, no matter what your skill level. There’s nothing better than a fire for warming up on a cold winter day. And if you don’t have a fire ring of your own, then why not make snow sculptures? Expanding simple shapes into large snow sculptures is a fun way to make something that’s eye-catching without being intricate. In this case, the sculptor helped bring the flames to life with color. And to do this to your own sculptures, just dilute food coloring in water and apply with a brush or spray bottle. You may have an awesome man cave inside your home, but why keep your team pride hidden away? So make a proud statement with snow sculptures of your favorite team. But just be aware that if your neighbors don’t share your loyalty, you may be setting yourself up for a massive snowball fight. In this sculpt, the dark areas are slightly colored, but the cutaways are primarily darkened by shadow. And the orange on the mane looks to be painted cardboard or foam core, another easy way to add some color to your winter sculpts. Some people hesitate to play with snow sculptures because they’re afraid that they need the photo-realistic artistic skills of a Renaissance master. And it’s true that sculpting skill is important if you want to sculpt something like a recognizable celebrity face. But sometimes getting loose with your creations gives you the freedom to stop worrying about the details and just enjoy the process. These cartoon-inspired robots may put you in the mood of futuristic gadgets. But their simple, fun shapes don’t require perfect symmetry or lavish attention to detail. So get out there and start moving some snow! If you’ve still got some hesitation about backyard snow sculptures, consider this artist’s path: opting for many small sculptures to create an impressive effect. And just like aspiring woodworkers can learn by tackling many small, surprisingly easy projects, so too can aspiring snow and ice sculptors learn by repeating the same shape over and over. If you’re ready to combine loose designs with recognizable characters, then consider creating snow sculptures of classic cartoon characters. And the smooth curves and exaggerated proportions of cartoons are great fits for working with snow and ice. Also because the characters are so beloved, they’re almost a guarantee of comments from passers-by. Of course, sometimes your snow sculpture will inspire other projects. So if you recreate the sculpture in this photo, you may end up wanting to build a dog house for your own pet when you’re done. We’ve already mentioned how easy it is to add a little color to snow sculptures. And while it’s possible to use diluted paint to spruce up your snowy creation, food coloring is a more popular choice, both because of price and its kid-friendly nature. A little bit of color can go a long way on the predominately white canvas of snow, just like a vibrant front door can make a house stand apart from the crowd. For full-on kid fun, create a snow sculpture that has the structural strength and a low enough height to allow little ones to hop on. This is a great way to keep them involved with the project, and finding ways to make work fun is essential. And this is true whether you’re building snowmen or getting them involved in DIY. Kid-sized snow sculptures also have the advantage of being relatively small. So they’re not that time-consuming to build and don’t require a full blizzard of snow in order to create them. Of course, there’s no rule that kid friendly means small! And instead of being rideable, this snow sculpture is a hollowed-out snow fort, allowing kids to play inside while still looking awesome from the street. Snow forts are great fun, a kind of tree house on the ground. But just be sure that there’s not too much snow overhead. Eventually, all such forts and snow sculptures melt, and you don’t want any kids inside when that happens. So safety first, and then let your imagination fly! When picking the design and location for your snow sculptures, consider the wider environment. The snow dragon in the photo is a great sculpt. But what really makes it stand out is the dramatic lighting. Notice that while the dragon no doubt looks great from any angle, it’s designed to look best from a certain spot. Look over your property for outdoor lights, trees or anything else that you might be able to use to your advantage when planning your snow sculptures. Sometimes, the joy in snow sculptures lies in finding the right way to look at existing drifts. And this adorable polar bear, for example, was created by adding just eyes and a nose to a clump of snow on a tree. By making small adjustments to already existing snow mounds, you can create art in unexpected places. And use the natural curves and shapes that have formed organically. In this photo, even the texture of the snow looks like fur, and the end result is a polar bear that looks like it would be at home in most toy rooms, as well as out on the polar ice flows. Of course, if nature doesn’t provide, there’s no reason not to improvise on your own! This snow sculpture uses the tree as a support, and creates an immediately recognizable shape in an unexpected spot. Again, notice how the loose lines lend themselves to the shape of the rabbit. 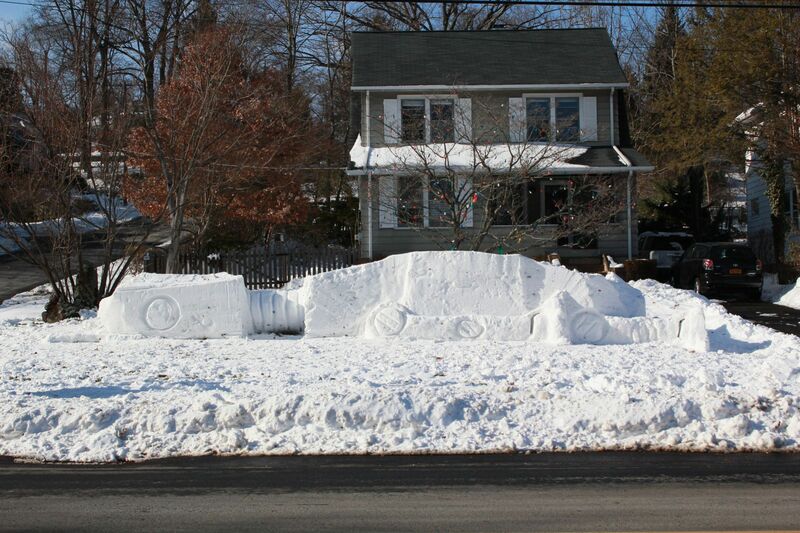 And this is a great example of a fast and fun snow sculpture that makes the yard more enjoyable. So whether you just happen to be walking through the woods, or you’re planning which trees will need to be pruned come springtime, stop and take a minute to create a little art on your way. You’ll be glad you did!